The MIDI Mate has been designed with one concept in mind: allow the performing musician complete and easy control over their MIDI equipment. The MIDI Mate is an intelligent controller allowing you to send up to six preset changes on six different channels and five control changes while controlling one realtime parameter via a volume pedal ALL AT ONCE. Unlike other "dumb" foot controllers that send one MIDI command on one channel, the MIDI Mate lets you take full advantage of your MIDI gear in programming and most importantly, on stage. A large seven character LED screen displays song titles while preset LEDs show which preset is recalled. This sturdy, compact unit houses EEPROMs for memory storage so presets will never be lost (like they can in simple battery-storage controllers). 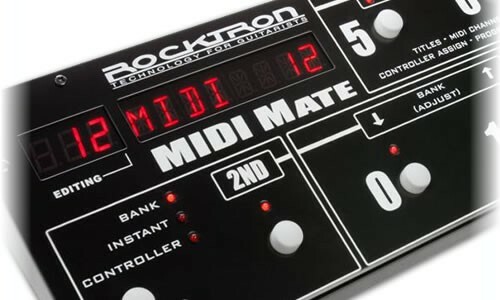 The MIDI Mate also features a 7-pin MIDI connector, allowing phantom power to be used with a 7-pin MIDI cable, (such as Rocktron’s M7 cable, the RMM900), avoiding extra adaptor cables on stage. 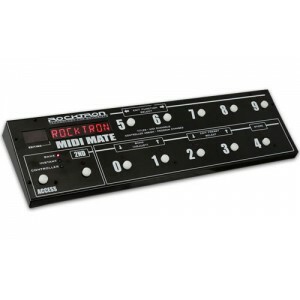 The MIDI Mate is the preferred choice for countless professionals. After many years on the road, the MIDI Mate has been proven the most reliable, problem-free foot controller on the market. 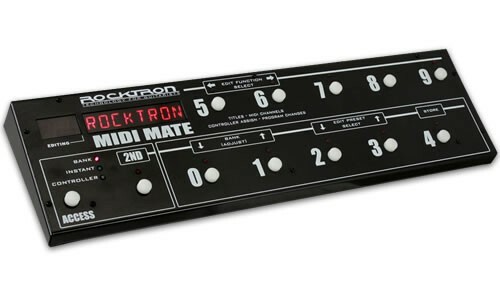 Rocktron's MIDI Mate has three modes of operation. 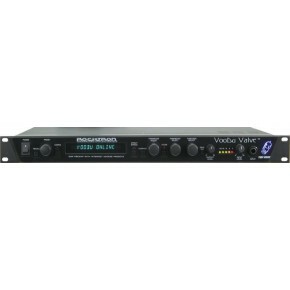 Mode One is the BANK Mode and allows the user to step through 128 presets in groups of ten. Mode Two is the INSTANT Mode which allows the user to select preset 01 through 99 with only two foot taps. This makes it easy to jump from a lower bank to a high bank with a minimum of scrolling. For example, you can jump from preset 20 to preset 86 instantly without scrolling from bank 2 to 8. - Mode Three is the CONTROLLER Mode which allows the user to program buttons 5 to 9 (top row) to access on/off controller assignments (not presets) while buttons 0 to 4 (bottom row) access presets. This allows presets to be recalled and modified (turn off/on chorus or delay, for example) without the need to switch modes.